At a client I worked some time ago, a consultant who had worked there prior to me had told the client developers (mostly from VB 6 background) a "best practice": use ByRef when passing reference type parameters and ByVal for value type ones. Besides the obvious confusion of the concepts, this practice and a particular VB.NET compiler design had caused a subtle bug in the application that was difficult to track down. That application was written for .NET framework 1.1 with VS.NET 2003. Now the VB.NET compiler for VS.NET 2005 still does the same so I am able to contrive a simple example to demo this bug in VS.NET 2005. 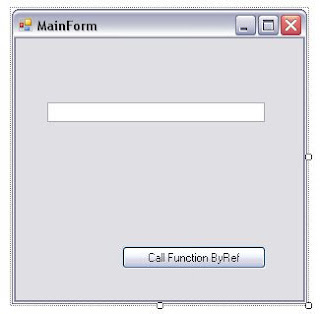 The textbox "txtName" has a design time handler "txtName_Leave" defined for its "Leave" event. During form load, another handler "AnotherHandler" is added dynamically to handle the same "Leave" event. The client application had a framework, which uses a generic event handler to monitor form all kinds of events - the "AnotherHandler" is just simulating that handler in the framework. Note that the framework's generic handler needs to be called last in the delegate chain as it needs to look at the final attributes of the controls, since they may be changed by handlers that are put there at design time by form developers. IL_0019: ldstr "txtBox is passed to a function ByRef"
This VB.NET compiler behavior is clearly designed for the convenience of developers so they don't have to manually add or remove handlers in their code. Unfortunately not knowing this and following an ill-advised practice involving ByRef led to a really unexpected bug. This entry was posted on 1/22/2007 09:26:00 AM . You can follow any responses to this entry through the RSS 2.0 feed. You can leave a response, or trackback from your own site.